Travelling is fun! It’s a way to go out there and see the world and be at one with it. It expands your mind and allows you to take on new perspectives. You get to go on adventures and challenge yourself to be more and do more. It also calms your mind and allows you to do some deep thinking for the future. At the very least, it allows you to let go and have some fun. Ask any serious traveller, and they’ll tell you that two things that go hand in hand with travelling are eating and drinking. You need to nourish and refresh yourself, and that’s where the food that you eat and the beverages you drink come in. But food is perishable, and drinks tend to be more enjoyable at certain temperatures. Some are best taken hot while others are best taken cold. That’s why, just as surely as you’ll need to eat and drink, you’ll need something to transport and store that food and drinks in. You’ll need a cooler. That’s what this article is about. 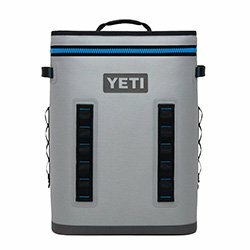 We made an effort to curate a list of the best coolers for travel based on category. 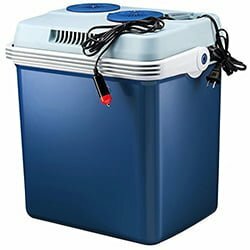 There are soft coolers for those who like to travel light, such as backpackers, bikers, short distance travellers, and so on. We also compiled a list of plugin coolers for those who travel long distances in RVs and boats and stuff like that and need a long-lasting cooling option. We also compiled a list of ice chests for all kinds of travellers. We looked hard at the features of each cooler model before putting it on our list. What we want to do is make your travelling a lot easier and more fun. That’s why we only went for the coolers that make this possible. And now, without further ado, here we go! These coolers are for those who don’t have very demanding cooler needs. Perhaps all you’re seeking to do is go to the mountain range in your area to hike for a day. Perhaps you just want to visit a nature trail at your local park. Maybe you’re a backpacker traveling across the nation, and you won’t be on the open road for too many hours at a time, often stopping at motels and AirBnBs now and then. Maybe you’re a biker, or you simply don’t have so much food to carry on your trip and also don’t want to have to deal with a heavy cooler. In that case, a cooler bag is an excellent choice for you. In that respect, we have 3 contenders in this category. 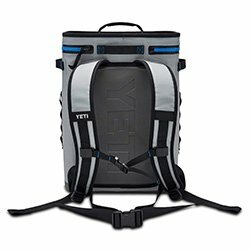 The Yeti Hopper Backflip is a great backpack cooler with a beautiful aesthetic design. It’s the kind of backpack cooler that you don’t just buy for its utility but also for its good looks and fashion appeal. That said, this backpack cooler isn’t slacking in the performance section either. 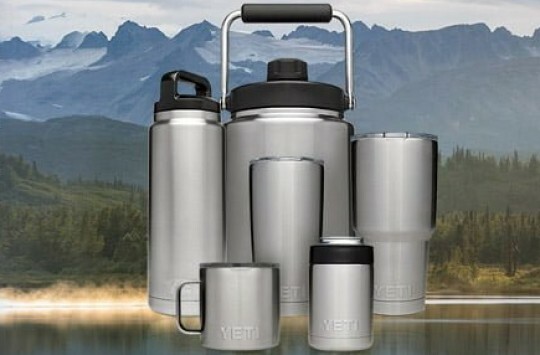 It has enough capacity to carry 20 cans of beer if you maintain an ice-to-can ratio of 2 to 1. It also features closed cell insulation, which offers the best insulation performance out there. 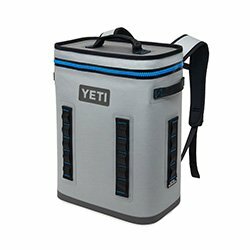 This cooler can keep your food and drinks cold for at least a day and will easily extend into the next day without any trouble. The Yeti Hopper Backflip 24 is also made of some pretty great fabric. The fabric happens to be waterproof and leakproof as well as resistant to tears and punctures. It is treated to be resistant to mildew and UV rays as well. The liner on the inside is BPA-free and is approved by the Food and Drug Administration (FDA) as food grade material. It’s also super easy to clean. The zipper is super high quality. It is waterproof and leakproof and also very high performing. It seals the back very well and does not compromise its insulation capabilities. It might need more than a little strength to operate, though. The price is also on the higher side. 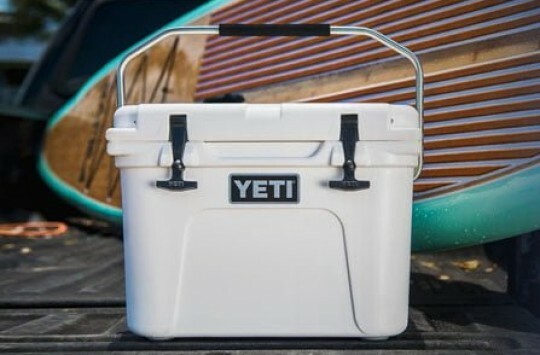 TIP: Learn more about this cooler in our Yeti Hopper Review. Engel Coolers is known for making some pretty high-quality products, and they definitely do not let you down in the soft cooler department. 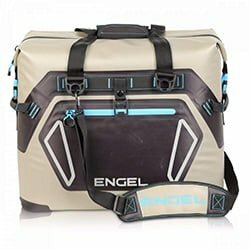 Here you have the Engel HD30 soft cooler, which has a capacity of about 24 cans with about 10 pounds of ice. 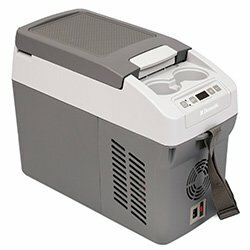 This cooler, believe it or not, claims to have the ability to retain ice for up to 4 days. When we did our own review of the Engel HD30, we achieved 3 days and a few hours, which we considered a pretty superb performance. Based on other user reviews on Amazon, it can do a minimum of 3 days, so that’s great ice retention for a soft cooler by anyone’s standards. 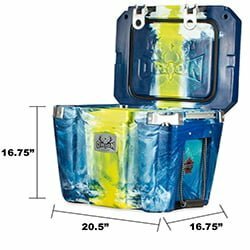 This cooler also comes with a rugged exterior that is not only waterproof and leakproof but also resistant to UV rays and mildew. The inner insulation is based on closed cell insulation technology, which is what contributes to its superior ice retention capabilities. The bag also has lots of options when it comes to carrying. There is a single shoulder strap for those who want to wear it over the shoulder, a grip handle, and side handles. 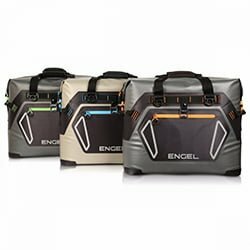 Whatever is convenient for you is convenient for Engel too! 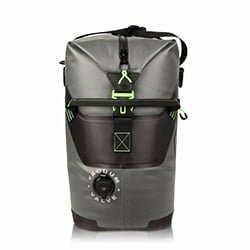 Our favorite feature for this bag, however, has to be the vacuum valve on the outside that draws air from the inside to help with insulation and keep ice longer. They even have a patent pending on it! 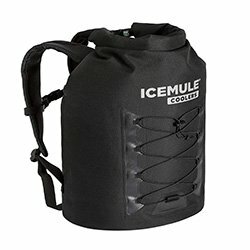 Icemule Pro Insulated Backpack is a great product at a great price. If what you’re looking for is something funky and fresh that does what it’s supposed to do (though not much more) and comes at a good price, then this cooler is just right for you. 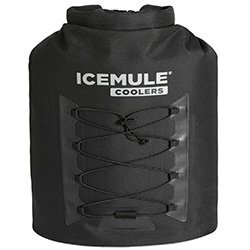 This cooler is shaped like a punching bag, which we find really interesting and unique because it’s not every day you see a soft cooler shaped like that. 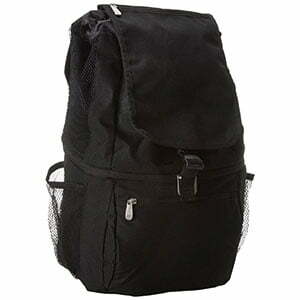 It is designed entirely in backpack style, which means you can only carry it as a backpack. In fact, Icemule prides itself on that design, calling it “keeping your hands handy.” The straps sure are comfortable, being very well-padded and ventilated. We certainly have no complaints there. Another thing we love about the Icemule is how portable it is. 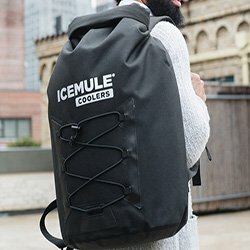 This backpack cooler is collapsible, owing to its unique design, which means that when you’re done using it, you can just roll it up and stow it away. That’s way better than a bulky ice chest in the space-saving department! This cooler also has no welded seams or zippers. You don’t need any of these to load or unload it, which should be great news for those who hate to operate zippers. It also floats, which makes it perfect for kayaking trips. Travel, by its very nature, includes long-distance travel. Coolers are great, and the best of them have pretty good insulation that retains ice for several days. All of this happens without the use of power, electric or otherwise. You just need to throw in a few pounds of ice along with your food and drinks, and you’re good to go. But even that isn’t enough if you’re apt to travel great distances that take more than a week. Also, with some cooler contents, it would make more sense if you had control over the temperature level of your cooler, not to mention the ability to raise the temperature for those contents you would like to keep hot, rather than cold. The Dometic CF-040AC110 Plug-In cooler is as good as it gets when it comes to the world of electric coolers. To start with, this cooler can be used with both DC and AC power supplies. With DC it works with 12-volt and 24-volt power supplies while with AC power supplies it works well with 110-volt power supplies. When it comes to cooling performance, it’s pretty hard to beat the cooling capabilities of the Dometic CF-040AC110 Plug-In Cooler. It can deep freeze contents within a temperature range from 50 degrees Fahrenheit on the higher side to 0 degrees Fahrenheit on the lower side. That corresponds to 10 degrees Celsius on the higher side to -18 degrees Celsius on the lower side. 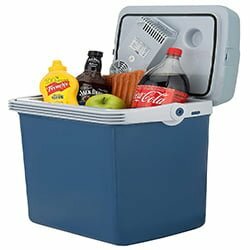 The cooler has a lid on the top, just like a regular cooler, which means you can put it in a confined space without having to leave space for the door to open like you would have to do with a regular fridge. It also has a sturdy handle for carrying when you want to haul it around. 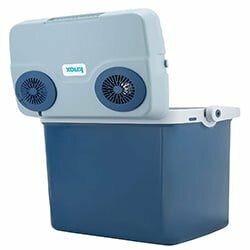 The Dometic CF-040AC110 Plug-In Cooler comes in numerous capacities, ranging 10.5 capacity liter cooler to the 106 capacity liter cooler. That means you’re well-sorted, no matter what your needs. TIP: For more information on Dometic Coolers, read this post. 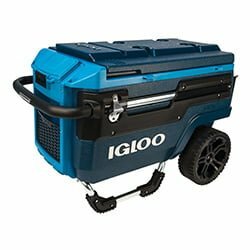 Igloo is a solid brand that’s known for making good quality hard coolers. 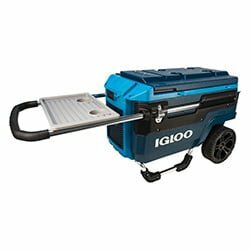 The Igloo Iceless 12V Plug-In represents their foray into the world of electric coolers. With this cooler, what stood out the most for us was the design. We particularly love the way the cooler is curved in the back. That way, it gently curves against your body when you’re carrying it. That’s going to be a very comfortable hauling process; much better than the experience you have with other coolers, both electric and non-electric! In terms of power supply, this cooler is a little limited. You can only plug it into a 12V DC power source, which sort of limits your choices a bit. Even so, it should work well with your car battery and can be plugged into the cigarette lighter on the dashboard of your vehicle. TIP: Read more about Igloo Iceless and other similar coolers in this post about 12V coolers. By now you’ve probably figured out the pattern we use to list our coolers. We have a best option, a runner up, and a budget option for those who are looking for something a little cheaper but still of good quality. 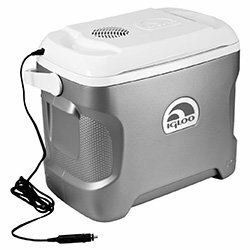 In that case, the Knox Gear 27 Quart cooler/warmer is our budget option when it comes to electric plug-in coolers. This cooler is quite simple in its design and isn’t the kind of cooler you go looking for when you want to make a statement. All the same, it does the job well enough and is affordable enough that it’s worth buying. 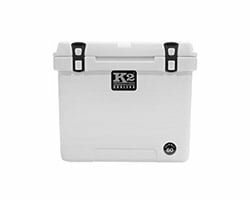 The Knox Gear 27 Quart actually serves both as a cooler and a heater, giving you plenty of versatility in terms of what you can use it for. It also plugs in just about anywhere. It has two cords. One is for wall outlets that provide AC power while the other is for car power adaptors. Both of these cords can easily be stored in their own storage compartments so you won’t have to worry about them hanging around dangerously and looking unsightly. This cooler has pretty good storage capacity at 27 quarts, considering you won’t need to make room for ice. You can store up to 30 soda cans or food, and snacks with a 2-liter bottle of whatever drink you’ll be taking. It also has a removable divider that makes compartmentalization much easier. The lock on the Knox Gear is automatic, which means that it clicks on its own whenever the handle to the cooler is up. To unlock it, all you have to do is flip the handle to the side of the cooler. Our final category is that of ice chests, which represent the main class of coolers. Hard coolers are great at what they do. However, they have one problem, and that is that they can be quite bulky and heavy and difficult to carry or haul around. When it comes to looking for a travel cooler, therefore, what you want is something that is convenient to move around. We looked around for the best options and here are the ones we came up with. 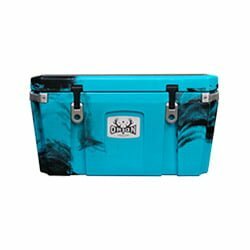 Orion is a great cooler brand that dedicates itself to making hard coolers for travelers, hunters, and fishers alike; basically, people who are likely to be traveling a lot. 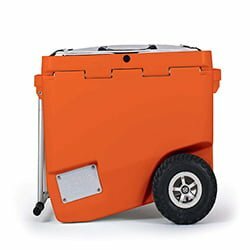 Their coolers, therefore, are pretty well designed to do the job. 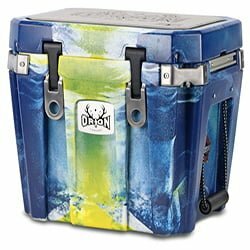 Orion coolers come in many different capacities, ranging from the 25-quart cooler to the 85-quart cooler. They also have plenty of colors on offer in their Amazon store. What we love the most about their colors is that they are very fresh and adventurous in nature, fitting perfectly into the traveler niche. They even have camo options, which hunters will appreciate. 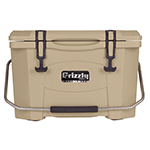 When it comes to the ice chest itself, all of them are certified bear resistant. They are made of rotomolded plastic, which puts them at the top of the line. They have a strong lockable lid with a commercial grade gasket on top as well as 2 inches of insulation on the inside. They also feature a standing pad, drain plug, tie-down points, low profile latches, handles with motorcycle grip, and a highly functional tray system. For those who love to document their travel with GoPros, the Orion ice chest features built-in YakAttack tracks and RAM integration, which allows you to mount your GoPro camera and just about anything else, including your phone, a GPS device, floodlights, and so on. 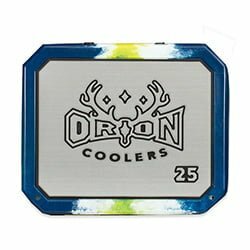 TIP: We also have our very own in-depth Orion Cooler review that you can read. We absolutely loved this cooler when it came to innovation. Basically, if you cycle a lot, then this is the perfect companion. You can attach it to the back of your bicycle and haul it around on your travels. 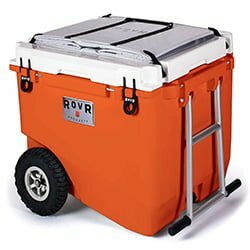 The Rovr has a capacity of 60 quarts, which means it’s more than enough for most people’s needs. It also has wheels to help you haul it around when it’s full without stressing it. It comes with a pull handle, a prepping board, a wagon bin, anchor points, dual cup holder, and a bike attachment. According to Rovr, it has up to 10 days of ice retention. We haven’t tested it yet, but customer reviews on Amazon indicate that it does indeed retain ice for several days at least. It also has an organized interior that includes a dry bin for dry goods. It has a wagon bin on the outside to help you transport your gear. With a cooler like this, traveling is definitely going to be fun! 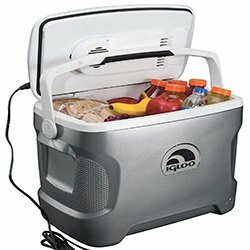 If you’re on a budget, then Igloo’s got you covered with their Trailmate Journey Cooler. This cooler is not only affordable but also comes loaded with features. It is wheeled, of course, and has a telescoping handle that you can use to haul it around. You can also fit a butler tray on the telescoping handle for prepping things before you put them into the cooler or as your own little table when you’re enjoying a cool drink out in the wild. The ice retention on this cooler is a little on the lower side at 4 days. That becomes understandable when you consider the fact that it’s not rotomolded. However, given the numerous features the cooler has, it’s definitely worth it. It also features two bottle openers, and a sturdy lid you can sit on. Read our full Igloo Trailmate review for more details or check out what Amazon customers think of it. And those are our best travel coolers, ladies and gentlemen. As you can see, the world of coolers features plenty of options in this niche, and you’re sorted whether you have deep pockets or are on a budget. Next time you’re thinking of traveling and need a cooler, come to this page and make your pick. Otherwise, have a cool day! Tumbler Wars: What's The Best Tumbler In 2019?